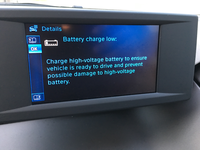 Does a 200mile one-way trip need "hold charge" function? 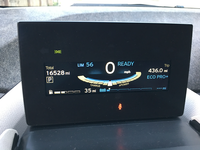 Ready for a EcoPro mode road trip! 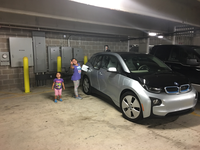 I own a 2014 i3 Rex and I would like to drive from Houston To San Antonio, Texas. This trip is about 200 miles one-way. My car is set up with the factory "coding" I plan on taking my family on the trip, so, all 4 seats will be occupied. With 2 adults and 2 children under 10 years. There are no DC fast charge or combo chargers from Katy, Texas to San Antonio. I can bring my factory supplied BMW level-1 charger for what its worth. -Should I consider coding to add the suppressed European "hold battery charge" function? -Will I damage the battery running of pure Rex for most of the trip? -Do or should I drive at a lower speed because of the passenger weight, i.e. 65 MPH vs 75 MPH speed of traffic? Thank you in advance of your replies! I've owned that very same car, and done that very same drive many times about a decade or so ago, and if I remember correctly, the gas stations are spaced a bit apart outside of metro areas (maybe every ~40 miles on average), so timing gas refills will be important. I would not even look twice at EV chargers along the road, since you have a REX. L3 are n/a, and either L2 or L1 will take far too long for everyone involved, especially the passengers. The key to longer road trips on REX is to use-up the gas tank ASAP, so when you see a gas station, you can fill it up to the max again. 2). enable "hold charge" feature so that you can force REX to manually run and use-up the gas tank at any time after battery charge drops below 75%. Then you can charge forward on BEV power until you see the next gas station, fill up full 1.7 gallons, switch back to running on REX, repeat as necessary. I had done 250-300 mile trips like that reliably, with minimal excitement. It does help if your destination has an L2 charger so that you can charge back the battery to 100% for the drive home! Yes - don't do it! I know I said I had done it before successfully, but it wasn't all that much fun. 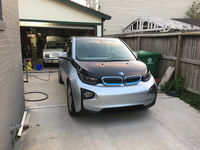 I had since retired i3 from all highway cruising duty, and re-leased a BEV instead. i3 is just not a very good highway car! Super-narrow tires are very darty and not very stable at high speeds, and they do tramline noticeably in highway truck grooves. The narrow, light, and high profile i3 body is very susceptible to cross winds, and you will get buffeted by strong TX winds, and every time you are passed by an 18-wheeler doing 75+mph next to you. The car is a handful to keep straight at TX highway cruising speeds (80+mph). It's just tiring. And it's noisy. The faster you go, the lower the chances that the radio will drown-out the wind noise. Any suggestions for a "coder" in the Houston area? Or tips on how to weed-out sketchy programmers? I am somewhat tech-savvy, IF you know...is coding difficult? I am grateful for your honesty! However, as a geek and a car guy...I want to say that I did it. It's brain-dead simple. If you can hook-up a printer in your house, you can do it. You are not really "coding" the car, as in there is no programming involved. You are merely changing the predefined configuration settings that BMW normally varies across different markets. Understood, I did the same a few times to get it out of the system. An even simpler solution is to install the BimmerCode app on your iOS or Android smart phone and pay its developer ~$27 to enable the saving of coding changes. You'd also need to buy a Vgate iCar OBD WiFi device that plugs into the OBD port and connects to BimmerCode via the device's WiFi transceiver (~$20 at Amazon). No need to find and download the current pirated versions of BMW's nerdy Windows app and the data file that this app requires which could expose a Windows PC to malware. An even simpler solution is to install the BimmerCode app on your iOS or Android smart phone and pay its developer ~$27 to enable the saving of coding changes. You'd also need to buy a Vgate iCar OBD WiFi device that plugs into the OBD port and connects to BimmerCode via the device's WiFi transceiver (~$20 at Amazon). In early November 2017 The trip was a success, in the vehicle with all factory settings. 436 miles total. Basically, Houston to San Antonio then back to Houston with charging once I arrive in San Antonio, Texas at a level two charging station. More of the trip was on the Rex. 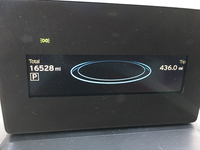 With about 190 miles EV only. I will post all photos in another thread.